Good, bad or ugly? What was 2009 like for Pentax? Matt Grayson takes a look at Pentax' latest offerings and puts them to the test. Andrew Cowin waits for the magical hour to share his tips and tricks for twilight photography. John Riley returns with part three of his beginner advice and looks at image resizing. 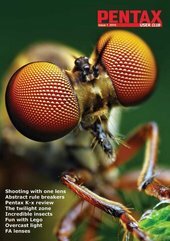 Pentax User interview Thomas Shahan, who loves nothing better than a good bug hunt. David Askham explains how shooting with your lens wide open can increase the impact of your photography. Craig Roberts has some ideas to share for photography on dull days. Matt Grayson gets arty with his photography.